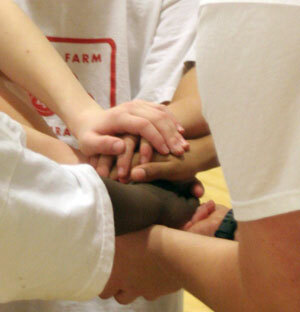 A variety of youth sports are offered. Please review the links below for information on registration, rules, practice times and game schedules! For more information, please contact the CRC office at 620.251.5910 or e-mail our sports director at crcsport@coffeyvillerec.com. If you are interested in becoming a volunteer coach please complete the coaching application and the code of ethics. Upon completion, submit both documents to the CRC office. Due to a new study that has found an association between head injuries sustained during participation in youth tackle football and impairments later in life, the Coffeyville Recreation Commission would like to announce that what was formally 3rd and 4th grade tackle football will be modified to a flag football league. Starting Fall 2018, this league will utilize helmets and shoulder pads but will limit contact to increase safety. With the greater risk of brain related problems associated with playing youth tackle football, area coaches, CRC Board, and the CRC Sports Advisory Committee’s focus is the safety of participants while developing physical skill and mental readiness. Coffeyville Recreation Commission strives to ensure a positive safe environment for our youth. YOUTH VOLLEYBALL IS OFFERED IN THE FOLLOWING DIVISIONS: 3rd - 6th AS OF 2016-2017 SCHOOL YEAR. COMPLETE THIS REGISTRATION FORM AND RETURN IT ALONG WITH THE REGISTRATION FEE TO THE CRC OFFICE (LOCATED IN WALTER JOHNSON PARK) DURING REGULAR OFFICE HOURS (MONDAY-FRIDAY, 9:00 AM-5:00 PM). THE CRC OFFICE PHONE NUMBER IS 251-5910. ALL REGISTRATIONS MUST BE SIGNED BY A PARENT OR LEGAL GUARDIAN - NO EXCEPTIONS! The Coffeyville Recreation Commission recognizes the need within our community to provide assistance to residents who do not have the financial resources to participate in the fee-based services we provide. Financial aid is available for those requesting assistance with Recreation Commission youth programs. AFTER JULY 22nd KIDS WILL BE PLACED ON A WAITING LIST, THERE IS NO GUARANTEE THAT THEY WILL BE PLACED ON A TEAM FROM THE WAITING LIST. Basketball leagues are for boys and girls 4 yr old - 6th grade. Complete this registration form and return it along with the registration fee to the CRC office during regular office hours (M-F, 9 AM to 5 PM). Or after hours you can drop your registration and check/money order in the drop box located just outside the CRC main doors. The CRC office phone number is: 620-251-5910. All registrations must be signed by a parent or legal guardian-NO EXCEPTIONS! All Late Registrations will have a $3 late fee assessed. CO-ED SOCCER IS OFFERED IN THE FOLLOWING DIVISIONS: 4yr – Pre-K, Kindergarten-1st, 2nd-3rd, 4th-5th, 6th-8th, AS OF 2018-2019 SCHOOL YEAR. COMPLETE THIS REGISTRATION FORM AND RETURN IT ALONG WITH THE REGISTRATION FEE TO THE CRC OFFICE (LOCATED IN WALTER JOHNSON PARK) DURING REGULAR OFFICE HOURS (MONDAY-FRIDAY, 9:00 AM-5:00 PM). THE CRC OFFICE PHONE NUMBER IS 251-5910. ALL REGISTRATIONS MUST BE SIGNED BY A PARENT OR LEGAL GUARDIAN - NO EXCEPTIONS! It is a requirement that all participants wear shin guards. The CRC will have shin guards available if needed. AFTER JULY 27, 2018 THE PARTICIPANT WILL BE PLACED ON A WAITING LIST, THERE IS NO GUARANTEE THAT THEY WILL BE PLACED ON A TEAM FROM THE WAITING LIST. Complete this form and return it along with the registration fee to the CRC office (508 Park Street) during regular office hours (Monday-Friday, 9 AM-5 PM). The CRC office phone number is 251-5910. All registrations must be signed by a parent or legal guardian-NO EXCEPTIONS! After April 12, kids will be placed on a waiting list! CHEERLEADING IS OFFERED FOR GRADES K –6TH AS OF 2016-2017 SCHOOL YEAR. COMPLETE THIS REGISTRATION FORM AND RETURN IT ALONG WITH THE REGISTRATION FEE TO THE CRC OFFICE (LOCATED IN WALTER JOHNSON PARK) DURING REGULAR OFFICE HOURS (MONDAY-FRIDAY, 9:00 AM-5:00 PM). THE CRC OFFICE PHONE NUMBER IS 251-5910. ALL REGISTRATIONS MUST BE SIGNED BY A PARENT OR LEGAL GUARDIAN - NO EXCEPTIONS! You will need Adobe Reader to open these files. If you do not have it, you can download it for free by clicking on the image below or visiting http://get.adobe.com/reader/.